Picture this: Christine and I walking around a major DC Art museum, surrounded by "the beautiful people," looking at paintings with an award winning Heavenly Spirits inspired cocktail in our hands on a Saturday night. I'll tell you, it is work, but I am not complaining. That's exactly how it went down on another fast and furious road trip, this time to the DC area last weekend. We also had the opportunity to run around town with our distributor, Shannon Crisp and meet some of the amazing people who carry our spirits in the DC area. For example, we got to meet Tim Adams over at MacArthur Beverages, Prav Saraff at 1 West Dupont Circle, and Nathan at S&S Liquors. I say "amazing people" because each one seems to have a distinctive passion and dedication for the job they are doing and because each one has an obvious knowledge and respect for the art of making spirits and they seem to take pride in expanding and sharing that knowledge. In addition to these fine retailers we also had the pleasure of meeting some great folks at a few on-premise accounts, including Boris at the Lincoln, Jonathan at the Firefly and Duane, who is the head bartender at Bourbon Steak, located at the Four Seasons Hotel. We had fun talking with Duane about a number of drinks industry topics and he introduced us to the best three variations of French fries in DC, (cooked in duck fat) each served with its own sauce. "Artini" featured mixologists from eight D.C. restaurants, which concocted special cocktails inspired by a work of art from Corcoran's collection. Artini 2013 marked the sixth year for this annual event and it was a huge success, raising a ton of money for a worthy cause; more exhibition opportunities for emerging Washington DC artists. For CC and me, it was our first "Artini" and I hope it won't be our last. Craft Wine & Spirits, our DC distributors did a fantastic job in making our products available to the mixologists representing some of the top DC bars competing in this year's event. We were especially pleased to learn that Heavenly Spirits products were chosen ingredients for five out of the eight competing cocktails, including the people's choice winner by Joe Ambrose from P.O.V., whose signature cocktail "First Impressions" was inspired by the Pierre-Auguste Renoir painting, "View From Cap Martin of Monte Carlo." Joe used Marie duffau Armagnac Napoleon, and Artez Poir Eau de Vie along with elderflower liquor, pear juice, lemon juice, maple syrup, chervil herb dust, berry foam and dehydrated raspberry meringue to make an outstanding cocktail that was tasty, and beautiful with the right combination of texture and smoothness. 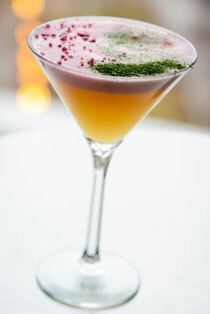 See the Artini 2013 Pinterest page here for photos and recipes. Additional Heavenly products that were represented during the evening include: Absinthe La Muse Verte and Armorik Single Malt Whisky; the Classic and Double Maturation. See our photo gallery page for more photos of this event.